1. To lock rows, select the row below where you want the split to appear. To lock columns, select the column to the right of where you want the split to appear. 2. On the View menu, click Freeze Panes. 3. To unlock rows, click Unfreeze Panes on the View menu. In case if you insert or delete and figure in document then you also have to update table of figures, to do that simply select the table of figures you created and navigate to References menu > Update Table and that’s all. 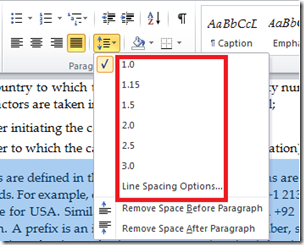 It is very easy to change the spacing before or after any particular paragraph or set of paragraphs. Simply select the paragraph(s) for which you are going to change the spacing and click on the Page Layout tab, here find the Paragraph group. Now choose the new spacing values in the form of points here. We have described the method of changing the space before and after the paragraph in the above section. Lets see how we can change the line spacing in your document. It is also very easy, click the Home menu and go to the Paragraph section here, and in the Line Spacing option, choose the new spacing that you need. You can double the line spacing by choosing 2 or triple it by choose 3 and so on. You can also remove spacing before or after the paragraph from this option. Enjoy!